Unpaid carers save the UK economy almost £60bn a year, suggests a new analysis of official figures by the Office of National Statistics. About 8% of the UK population living in private households acted as informal carers last year, Department of Work and Pensions figures show. The ONS calculates that it would cost £56.9bn to replace these unpaid carers with paid workers. Both sexes spent more time on unpaid care in 2015 than in 2000, it says. 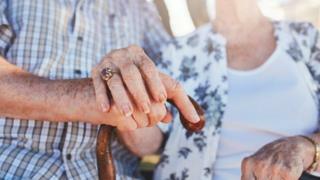 The ONS links the rise in unpaid care by family members to "a rapidly ageing population and a higher life expectancy". "At age 65 a man will spend, on average, 44% of the rest of his life in poorer health, and a woman, 47% of her life," says the ONS document. Women are more likely than men to be informal carers, with women making up 59% of carers. The Department for Work and Pensions definition of care is quite broad, including doing someone else's shopping or helping them with paperwork. The ONS also looked at figures for "active caring", which is the amount of time washing someone or replacing bandages. On average, women over 50 spent one minute and 15 seconds "actively caring" for someone each day, the ONS found. The figure for men of the same age was just 45 seconds. But the amount of caring time spent by both sexes had risen between 2000 and 2015, by 15 percentage points for men and 21% for women. The ONS analysis of the 2011 Census indicates that when women reach 50 they are likely to spend 5.9 years of their remaining life as unpaid carers. "In contrast, men at 50 are likely to spend 4.9 years of their remaining life as an unpaid carer," it says. By 65, these figures reverse, with 65-year old women likely to spend 2.6 of their remaining years as unpaid carers, and 65-year-old men 2.7 years, the ONS says. The analysis found that half of adult carers were employed either part- or full-time. And almost a third of these (29%) said they spent 35 hours or more a week as informal carers. The value of unpaid care outweighs the amounts spent on formal social care, the document suggests. The latest figures show that NHS England spent almost £17bn on social care in 2015-16, while Wales spent £1.4bn. Scotland spent £2.9bn in 2013-14, according to the latest figures available. Northern Ireland calculates the figures in a different way, so they are not directly comparable, says the ONS. Heléna Herklots, chief executive of Carers UK said the organisation's own research reflected the ONS analysis. "More and more of us are providing care for an older, disabled or ill loved one, yet even a few hours caring a week can result in having to cut down hours or give up work, bringing devastating and irreversible consequences for long term financial security. "As our population ages, growing numbers of people will be juggling work and care, particularly in later life and society and public services must adapt to support them," said Ms Herklots.